George Balanchine is perhaps one of the most well-known names in the world of dance due to his creation of a new style and technique of dance as well as for his incredibly prolific career. From “La Nuit” in 1920 to “Variations for Orchestra” in 1982, his style became known and recognized and adored. Balanchine worked with many well-known companies and schools (Ballets Russes, Ballets Russes de Monte Carlo, School of American Ballet, Ballet Society are among them) until making his home at the New York City Ballet, where his masterpieces are still performed with aplomb today. Even people who aren’t very familiar with Balanchine have most likely seen The Nutcracker, one of the most well-known and popular ballets of all time, which he choreographed for the New York City Ballet in 1954. 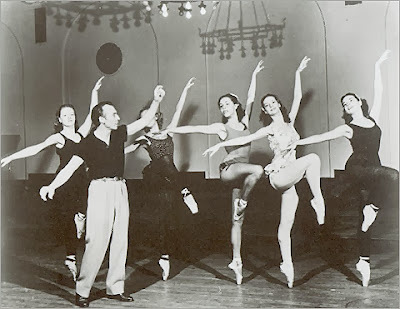 Balanchine was one of the pioneers of a new “American” school of dance, and he created his own technique which is still taught in many schools today. George Balanchine was born Georgi Balanchivadze in St. Petersburg, Russia, 1904, into a middle-class family of Georgian and Russian descent. His parents were Meliton Balanchivadze, a little-known composer from Georgia and the much younger Maria Vassilyeva from St. Petersburg, and he had a younger brother, Andrei, and an older sister, Tamara. When Georgi was small, the family acquired a stroke of luck by winning a lottery, but bad decisions and investments soon depleted their newfound fortune. The family used what money they had left to move to a house near Lounatiokki, Finland (but what was at that time still part of Russia), and Georgi, Andrei, and Tamara would spend happy years there. Georgi received an education in mathematics, reading and writing, history, and music. For Georgi, playing piano was a hated chore until one day he had an epiphany: “As he was thumping mechanically at a movement of a Beethoven sonata, something of the potential beauty....of the music...brought tears to his eyes” (Taper, p.31). From then on Georgi loved the piano and grew quite prolific at it, playing with his sister accompanying him on violin. Had he so chosen, he could have likely become a well-known pianist due to his skill. Georgi’s parents had planned for him a military career, and it was a happy accident that led him to enroll in the Imperial Ballet School. When he was nine, his mother took him and Tamara to St. Petersburg to enroll him in the naval school and to enroll Tamara in the Imperial Ballet School. On a whim Georgi auditioned with his sister, and while she was not accepted, he was, and thus his ballet career began. Georgi, as a first-year student, was placed on a one-year probationary period in the academy. Georgi hated it with a passion and even ran away to his aunt’s house in St. Petersburg to escape the school. But luckily for the world of dance, Georgi had another epiphany. While he was dancing onstage in a performance of The Sleeping Beauty, the beautiful music and grandeur opened his eyes to the magic of the ballet, and soon he couldn’t get enough. He danced in ballets such as Swan Lake and Paquita. However, with the overthrow of the Tsar in the Russian Revolution, who had been a patron of the arts, the Maryinsky Theatre and the Ballet School were closed. Georgi went to live with his aunt, and he never again saw his parents or sister. Gradually dance spectacles were adopted by the Bolsheviks to be performed at Communist Party meetings between the endlessly long debates, and soon the Maryinsky reopened. However, there was a meager budget for performances and the dancers were starved and freezing and lacked any sort of comfort or luxury. Georgi graduated with honors from the Ballet School in 1921 and became a member of the corps de ballet and soon began choreographing in addition to dancing. His first known piece, La Nuit, was a “scandal of eroticism” (Taper, p. 53), a duet between another student and him. He choreographed another romantic duet, Poeme, for the soon to be famous Alexandra Danilova and himself, and this piece was better received. Around this time, Georgi fell for a fellow dancer, the beautiful, blonde Tamara Geva, and despite their young ages (he was eighteen; she was fifteen) they were married. Despite his modest successes in Russia, Georgi realized that in order to fully flourish he would have to escape Russia, and he did in 1924 with Danilova, Geva, and several other promising young dancers. They toured briefly, and joined the Ballets Russes, led by the clever and enterprising Serge Diaghilev, who was looking for a choreographer as well as dancers. Diaghilev engaged Georgi as the ballet master for the well-known and respected company when Georgi was twenty-one and Georgi changed his name to the more universal-sounding George Balanchine. As choreographer for the Ballets Russes, which toured all over Europe, Balanchine choreographed dances to operas, updated classics such as Swan Lake, and choreographed such enduring masterworks as Le Chant du Rossignol (in which the fourteen-year-old Alicia Markova starred as the Nightingale) in 1925, Apollo in 1928, and The Prodigal Son in 1929. The latter work is counted among his finest. However, upon Diaghilev’s death in 1929, Ballets Russes fell apart and Balanchine, having since divorced Tamara, wandered around Europe briefly working for various dance companies, the Danish Royal Ballet among them. He joined the Ballets Russe de Monte Carlo in 1931 and created the well-received ballet Cotillion. However, the director of the company, Colonel de Basil, let Balanchine go when the opportunity arose to engage the more well-known choreographer Massine. Balanchine then created the short-lived company Les Ballets 1933, which lasted only one season due to its unpopularity, and seemed in a rut until he met the wealthy American ballet enthusiast Lincoln Kirstein. Lincoln Kirstein attended a performance of Les Ballets 1933 and fell in love with Balanchine’s work. He asked him to move to America to start a ballet company there and “fervently... promised Balanchine that by the time he was forty he would have a company and theatre of his own. Balanchine replied, ‘But first a school’ ” (Taper, pg. 151). Balanchine realized that America offered new and unique possibilities for him, while Europe “had become a museum” (Taper, pg. 151). Balanchine and Kirstein opened the new School of American Ballet on January 1, 1934 in a small studio in New York City. During this time, Balanchine created one of his most well-known works, Serenade, which was his first American ballet. The work was innovative in that Balanchine created the work around his dancers and was inspired by them and their actions, and Serenade is still in the repertoire of many companies around the world today. Balanchine also created other pieces such as Reminiscence, Alma Mater, and Transcendence, but none of his ballets were particularly well-received by the critics. However, a seeming stroke of luck fell upon the company when the Metropolitan Opera “invited the American Ballet to become the Met’s resident ballet company, with Balanchine as ballet master” (Taper, pg. 167). Kirstein, Balanchine, and the company were ecstatic at this idea. Unfortunately, this arrangement would not be as rewarding as Balanchine had hoped due to the flippancy and rudeness with which the opera’s management treated the ballet company. The opera was stingy with funds for the dancers and refused to let the dancers rehearse with the orchestra. Balanchine choreographed dancing to the operas The Bartered Bride, Aida, Carmen and Orpheus and Eurydice, which were lampooned by audiences and critics alike. Balanchine could not artistically flourish with the Metropolitan Opera, but the American Ballet was soon destitute and had to close in 1938. Balanchine then turned to choreographing for films and musical comedies. He created dances for the stage musical On Your Toes and through his unique style, reinvented the concept of film dance numbers. “[The norm was] a couple of soloists backed by a line of high-kicking showgirls; this dreary nonsense he replaced by genuine choreography” (Taper, pg. 180). He was hired by Samuel Goldwyn to choreograph a massive and expensive project called The Goldwyn Follies. For the film, Balanchine created his well-known water nymph ballet which was beloved by audiences and critics and Goldwyn himself. The Ballets Russes de Monte Carlo dancer Vera Zorina was hired to be the film’s ballerina, and Balanchine soon fell for her and married her in 1938. Their marriage was seven years of torment for Balanchine; they constantly separated and got back together, with Balanchine unable to keep hold of her affections. They divorced in 1945. In 1944 Balanchine returned temporarily to the Ballets Russes de Monte Carlo and created the ballets Raymonda and Night Shadow, among others, leaving in 1948. He rejoined Lincoln Kirstein and they created the new company Ballet Society. Balanchine created for Ballet Society two new masterpieces, the “astonishing” (Taper, pg. 212) The Four Temperaments and Orpheus. Balanchine fell for Maria Tallchief, one of his dancers, and despite the twenty-one year age difference, they were married and remained so for five years. Balanchine finally struck gold with Orpheus, for “on the strength of Orpheus, praised as one of New York's premiere cultural events of the year, Morton Baum, Chairman of the Executive Committee of the New York City Center of Music and Drama, invited the company to join City Center (of which the New York City Drama Company and the New York City Opera were already a part). With the performance of October 11, 1948, consisting of Concerto Barocco, Orpheus, and Symphony in C... the New York City Ballet was born” (Balletmet.org). At last Balanchine had a home for his new artistic creations, the funds to support them, and the venue to present them. Balanchine was the artistic director of the New York City Ballet from 1948 till his death in 1983. He engaged the famed choreographer Jerome Robbins as the associate artistic director during the company’s early years. Balanchine created dozens of famous and well-loved ballets, including La Sonnambula (1946), The Firebird (1949, revised with Robbins in 1970), Swan Lake (1951), The Nutcracker (1954), Agon (1957), Stars and Stripes (1958), Tchaikovsky Pas de Deux (1960), A Midsummer Nights’ Dream (1962), Bugaku (1963), Jewels (1967) and Coppelia (1974). Balanchine became one of the most respected and beloved choreographers of all time during his years with the New York City Ballet. He created the Balanchine technique, which deviates from other styles of training in that it requires the raising of the hip to increase the height of the leg and taking a pirouette from fourth with the back leg straight. It also involves incredibly fast movements and requires extremely fit dancers. In addition, Balanchine’s choreography is mainly focused on the female dancers; in some works the man does little more than support the woman. In 1952, Balanchine married another of his dancers, Tanaquil LeClerq and remained married to her until 1969. Tanaquil, who been poised to become one of the foremost dancers of her time, tragically lost the use of her body due to polio. Balanchine obtained a quick divorce from Tanaquil in 1969 when he fell for the young, beautiful dancer Suzanne Farrell. Suzanne Farrell was Balanchine’s muse and love during the 1960s and he created many starring roles for her, including the leading Diamond in Jewels. Suzanne was admitted into the ballet company at the tender age of sixteen, and she was plucked from the corps de ballets to partner with Jacques D’Amboise for Balanchine’s 1963 romantic duet Movements for Piano and Orchestra. Balanchine created the ballet Don Quixote for her, casting her as Dulcinea and himself as Don Quixote. He wrote her romantic poems and intended to marry her following his divorce, but she married fellow dancer Paul Meija, much to Balanchine’s heartbreak. Balanchine and Suzanne’s relationship deteriorated and in 1970 she and her husband left the company, returning in 1975. Balanchine died in 1983 at the age of seventy-nine. He had intended to live and choreograph much longer. He grew quite sick, and lost his balance, hearing and eyesight, which was detrimental to him. George Balanchine was one of the greatest, most innovative, and prolific choreographers of all time. Many of the works he created are still performed today by companies all around the world. Balanchine lived a relatively long life, full of triumphs and failures and heartbreak. Balanchine’s contribution to the dance world is impossible to ignore for his new ideas and ways of movement and expressions of emotion through dancing. Book: Balanchine: A Biography. Bernard Taper, 1984. Film: “Susanne Farrell: Elusive Muse”. Suzanne Farrell, Anne Belle, 1996. This was one of your grandfathers favorite choreographers; and your presentation of his life shows your love of the man's contributions as well. I never really knew of his versatility until now! Nice work! Wowie, what a facinating and eventful life this romantic had! Thank you for the rich story of this icon of ballet.